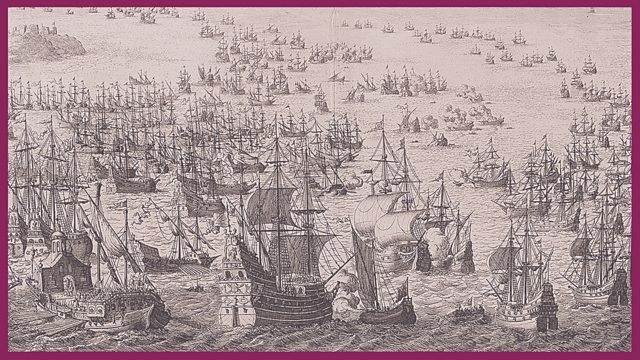 The drama is set in 1588 during the attack of the Spanish Armada. A young boy - Thomas Harte - and his father have just arrived onboard one of the English ships. They are not expecting to stay there, but are sent below deck by the captain and told to prepare for battle. Thomas recalls how just two hours before he and his father had been loading their small vessel with scrap iron for the navy's cannons. But when they row out to the ships they are pressed into action. Conditions are hot and cramped on the gun deck. The cannons are loaded as the Spanish ships approach - they are only 100 metres away. The ship fires a broadside and the Spanish vessel is badly damaged. The return fire causes terrible injuries. Later fire ships are prepared to attack the Spanish at anchor off Calais. The fire ships cause havoc and the Armada sails on in disarray. The victory is won...but for the victorious sailors the struggle is not over. They are kept at sea, forbidden to return home. When the sailors do land they are sick and abandoned. As Thomas observes, far more English sailors die due to neglect than to the attack of the Armada.